German Serial Composition happened in what for me counts as a rush. Signal processing—the maths behind the operation of mobile ’phones, digital television and other such staples of modern existence—is part of my day job, and it was while working on a project that I was reminded of the surprising story of Ms Lamarr and her part in the invention of spread-spectrum communications. I didn’t know all the details offhand, but they were quickly filled in with a scour of the web and a read of the original patent (which you can download and see for yourself—it is fascinating). I’m told she has also featured on QI. That left about two months to design the puzzle and write the clues to meet the vetters’ deadlines. As I said, a rush. The vetters prefer that thematic material be accessible to non-web-enabled solvers. Surely Halliwell’s would confirm her real name and her films, and Britannica her technical contribution, I thought naïvely? No. Halliwell’s is a shadow of what it once was, and I should have known that Britannica doesn’t deign to cover such dull topics as engineering in any depth. Fortunately a rootle in my local public library turned up the excellent The Film Encyclopedia: The Complete Guide to Film and the Film Industry by Ephraim Katz and Ronald Dean Nolen, which had all the information needed; and there was also a copy in the nearest Waterstones. I hoped my research would be enough to appease the vetters, and it was. I went through a few variations of the puzzle before settling on one which might give solvers the sensation of decrypting a message that had been ‘spread’ using a prearranged sequence of frequencies. Experimenting with various configurations of the secret message and running test fills I managed to find one that admitted a symmetrical bar pattern and gave sufficiently interesting answers to clue. Solvers didn’t need to know that the tune given was indeed a German serial composition (the idea also being that a composition of ‘G serial’ is Algiers, Lamarr’s first US film) but I hoped that some might get sidetracked into trying to find its source. It’s the upper voice of the subject from Karlheinz Stockhausen’s Mantra, for two pianos, some electronic equipment and other instruments. Similar forces, and in particular synchronised player pianos, were deployed in composer George Antheil’s controversial Ballet Mécanique, and, in turn, the idea of two synchronised player pianos running through the same prearranged sequence of notes inspired Antheil and Lamarr’s subsequent invention. Luckily the Stockhausen tune could be written in such a way that solvers didn’t need to know the rules about the persistence or otherwise of accidentals or their force across octaves. In fact, pretty much everything solvers needed to know about musical notation is in Chambers somewhere or other, and so, as one solver put it, even a tone-deaf cod would have a reasonable chance of decrypting the hidden message. I’d like to extend my gratitude to those who test-solved the puzzle, to the vetters for their refinements and courtesy, to John Green for his tireless devotion to the cause, and to all who sent their comments. I value them greatly. This week we have Quinapalus’s fifth Listener… and his second this year. Back in February we had Elm with its Pythagorean triple theme that required us to cut the grid and paste it back in a different shape. This week it looked like it was musical, having, as it did, some notes (very deep) on a stave below the grid. 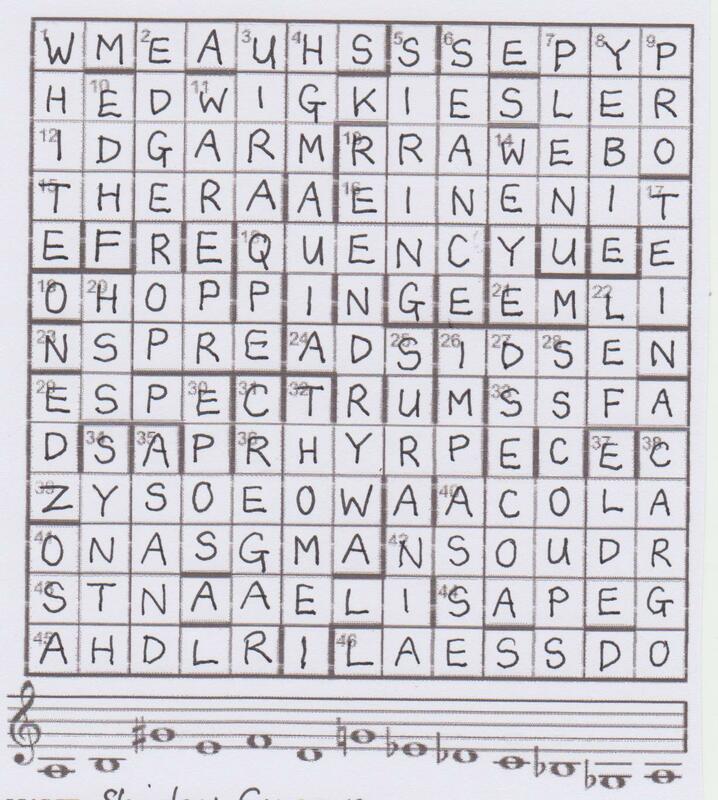 Clues were of two types: five needed treating in some way before solving, the rest, via misprints, provided an instruction, a title and a description of someone thematic. My recollection was that Quinapalus’s clues were on the tough side, and, although I got 6ac SHAWM, most of the acrosses eluded me, mainly because of devious misprints. A few of these were fairly obvious: 24 ‘creature found in tea’ for ‘creature found in sea’; 26 ‘uses sad language’ instead of ‘bad language’; and 43 ‘seen in treks in SA’ for ‘trees in SA’. Although I solved 26 DARNS, the others would have to wait to be solved, but 26 CREPY (‘chimps’ for ‘crimps’) and 39 SEACOAL (‘full’ for ‘fuel’) gave me a start towards the bottom of the grid. I had a bit more luck with the downs. I was off to a good start with 1 EDGER, 5 SEANCE and 6 SKREEN. I needed a bit of help with 13 Lacking charm somehow, fille de chambre replaced German gown (9): it was obviously an anagram of ‘fille de chambre’ minus the letters of charm, and eventually came out as BIELEFELD, a town in north Germany. 14 Initially maybe “alpha” uttered invitingly here (4) was MAUI, but seemed at first glance not to have a misprint. Eventually, I found that Maui was not only a Hawaiian island, but also a ‘hero’ in Polynesian mythology. It was quite late in the day that I solved the first of the five non-misprint clues, 41dn. I had AN· for some time, but D[iana] ROSS at 45ac delayed my seeing that it was just AND, with In German, fund let off deposit (3) needing the ‘f’ moving from ‘fund’ to ‘left’. When I moved the f from ‘scarf golfer’ to the front of ‘other (regional)’ to give CARGO at 35dn, a quick scan of clues that I hadn’t solved revealed that 42ac, 46ac and 8dn also had potentially misplaced efs. And so, Samson and Delilah and White Cargo were formed from the five effing clues! I googled the two titles, and was rewarded with Hedy Lamarr. I still had a few more clues to solve, so put off further research until later. PCS containing A (top grade); ‘Apple’ is misprint for ‘Apply’, and ‘One used to’ is part of the definition! And so, the endgame. It was time to google ‘german serial composition two pianos electronics’, and who do I find? Karlheinz Stockhausen, a composer whose music I have never got to grips with… to put it mildly! A link in his Wiki article leads to Mantra which is the thirteen-note tone row below our grid. None of that seems to help at the moment, though. Googling ‘Hedy Lamarr’, however, tells all. The second paragraph of her Wiki article says that she, together with George Antheil, invented an early technique for spread spectrum communications and frequency hopping. And this is, presumably, where the corrected misprints come in. These give (once I realise that the definition for 12ac GROWER is ‘I might tend rice’, not ‘I might tend vine’) Sort columns by frequency followed by Ecstasy and Bit of screen crumpet! Of course, the last two items take us back to Hedy Lamarr, and things are beginning to come together. Now in hindsight, I guess there are three ways that you could proceed from this point. Firstly, the sequence of letters in row 5, RQEYUNECEUEE, look like a jumble of FREQUENCY, especially if one of the Es becomes an F. Secondly, you could take the letters in row 2, which look like they could be changed to give Hedy Lamarr’s real name, HEDWIG KIESLER. Or, you could do it the way Quinapalus presumably intended. The preamble reads “follow the instruction with reference to the subject”. The subject is the tune given under the grid. Sorting the columns in order of ascending notes, ie frequency, and taking care of the duplicates and the E that needs changing to an F, we get FREQUENCY HOPPING SPREAD SPECTRUM in rows 5, 6, 7 and 8. I spent a bit of time wondering whether “sorting the columns” meant cutting them all up and then sticking them back together in the required order. I decided that a stronger hint would have been given if that were the way to go. And anyway, life’s too short if you’ve already made mistakes this year! So my entry was popped in the post and I was left feeling thankful for Hedy Lamarr and her contribution to modern day communications all those years ago. So thanks, Quinapalus, for another fine puzzle, and I assume the title is a cryptic clue to “Seeing Lamarr”. We completed our solve almost 24 hours ago and yet I have been putting off writing my blog – ironing, shopping, thinking up a few clues, solving a couple of weekend crosswords – and why? 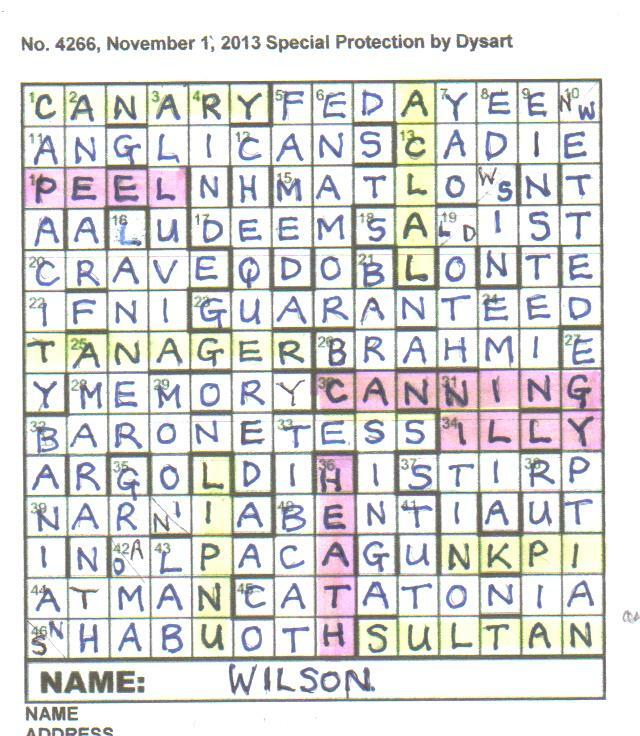 Well this crossword by Quinapalus was simply too mind-boggling and every time I look at it again, a further bit of brilliance appears. What is more, although I have little doubt that my solution is correct and that I have understood the preamble, I am still convinced that there is one aspect that I do not and probably never will understand. 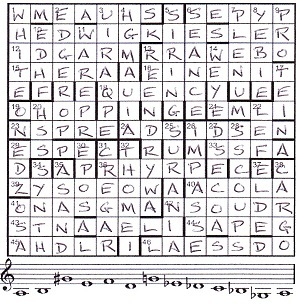 Those notes under the grid that are, I am told, from Mantra by Stockhausen, and can be read to give a frequency, say nothing to me, though I am sure my columns are now in the right order as they give a FREQUENCY in row five, followed by HOPPING, SPREAD and SPECTRUM and that is when HEDWIG KIESLER appears in row two with the columns in that order (‘SORT COLUMNS BY FREQUENCY’ said the corrected misprints). That, according to Wikipedia, was the original name of Hedy Lamarr. Hedy Lamarr was a familiar name as the fair used to come to my country village when I was small and we threw ping-pong balls into the throats of swans. If one rolled out into the slot with Hedy Lamarr on it (that meant nothing to me at the time), we won a goldfish in a plastic bag of water. Of course, the poor thing died within a week (what atrocious cruelty). However, we had that name imprinted into the long list of useless information that children store. Useless? What an eye-opener to find that here was yet another achieving woman of the early century (was it 1913 or 1914, her year of birth? – There seems to be some discrepancy) who not only starred in Ecstasy, Samson and Delilah and White Cargo, but also thought up the FHSS (Frequency-Hopping Spread Spectrum, a technique for reducing interference in radio broadcasting). After a rather astonished read of the preamble, where nothing much made sense to us (as is so often the case), I did a quick scan of surface readings, just to confirm that Quinapalus was retaining his membership card for the Listener tipplers’ club and he was modestly there, consuming mead and becoming plastered (obviously) ‘Suffer when one’s imbibed most mead (5)’ (with meaN for meaD LET round AS giving LEAST) and ‘Scots capers abort drinks gathering in company (6)’ (aboUt for aboRt and SUPS round CO giving SCOUPS – clearly in his CUPS by this time). We found the clues tough and some of the misprints raised wry smiles. One in particular amused us. Wikipedia confirmed what the other Numpty knew – that UNECE (one of three abbreviations, not two, as claimed in the preamble, aren’t PEC and PCAS abbreviations too?) was founded in 1947. Thus we had an L corrected misprint when MCMXXVII became MCMXLVII. Now that was original wasn’t it! ‘Monkfish is risky with indication of additive’ became ‘Monkish is frisky with indication of additive’ (WITH* + E) This was the frequency hopping. We had a third title, ECSTASY, too then what was claimed to be ‘a facetious description of the thematic person associated with the titles’. HEDWIG KIESLER was being described as ‘BIT OF SCREEN CRUMPET’ and this S[creen] CRUMPET, when ‘SPREAD’ or anagrammed, gave us SPECTRUM. Yes, all of this was brilliant, but it was when I attempted to rearrange the columns that I realized what a remarkable piece of compilation this was. How did Quinapalus manage to create this grid that gave real words in its original form, yet produced those four words when it was rearranged, putting her name in its correct order (obviously adding the G and another E and resolving the ambiguity of the two Is and Es that were already there). I simply can’t get my head round the feat of compilation. There was that last delightful little touch too. We actually had EREQUECY on row 5 but we were told that we had to erase part of an abbreviation of the third title. ECSTASY (E) had to lose just that one bar to become an F and give FREQUENCY. I thought that was hilarious and completed this with such a nod of approval for Quinapalus that my head is sore. Honestly! It was early on the Saturday of publication, and I was off to the Budock Vean crossword event in Cornwall the following day. 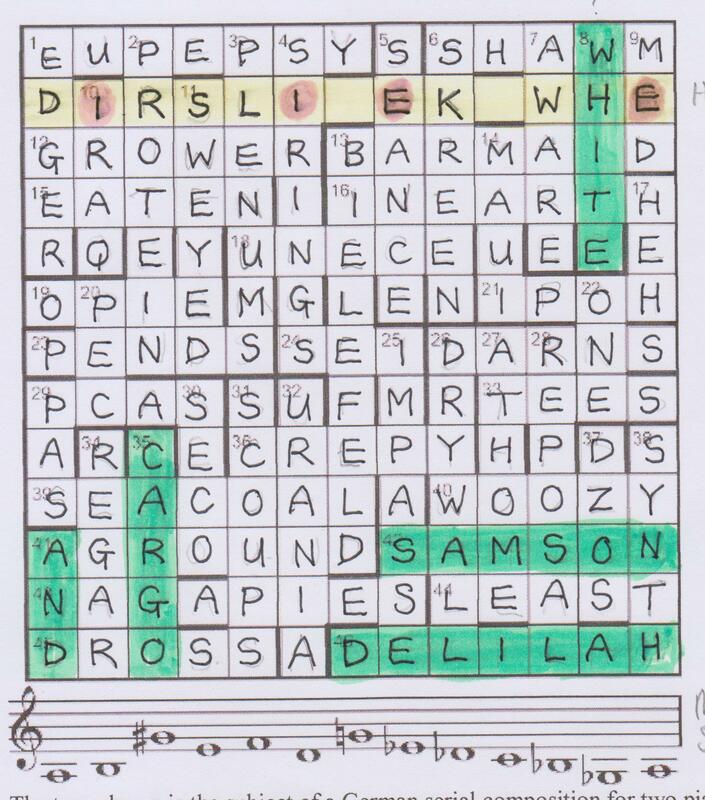 Normally, I wouldn’t start a Listener until Monday or Tuesday at the earliest, but I decided to tackle this week’s Dysart puzzle with the hope of getting it done and dusted before travelling down early on the Sunday. A quick look at my notes and I remembered his last puzzle, #4187 Prize and Prize-winner, with its Haruki Murakami theme and the delightful Franz Kafka red herring. It was possible that I was in for a tricky time. Well, it was clash time again, and, as seems to be the norm these days, we weren’t told how many. However, I got 5ac FEDAYEEN almost immediately and was feeling optimistic. I decided to forego my quick read through all the clues, and concentrate instead on the right-hand side of the grid. I’m nothing if not adventurous. 5dn FAMED was followed by Barrack Obama ensuring that we got the American spelling of 6dn, namely ENAMOR. 13ac CADIE and 17ac DEEM came next, and the unclued entry at the top of the column 10 spelt ACL··, which didn’t look like any word that I knew. I was sure time would tell. 8 EDWIN, 9 EINSTEIN and 10 WETTED dropped down from the top right, and I had my first clash with FEDAYEE[N/W]ETTED. This led to 18ac SADIST. Unfortunately the remainder of the right-hand side of the grid seemed to be twice as difficult as the top as I didn’t get any more! I must admit that I was guessing at the ‘twice’ nature of the difficulty…for all I knew, it could end up being five times harder! Consequently, I moved over to the left side of the grid, and was rewarded with a flurry of activity, and I regretted not having done my quick scan of the clues at the beginning. Oh well, the grid filled up nicely, with some sound clueing on the way. Eventually the grid was completed, except for the six unchecked letters in the unclued entries. Three of these read N·PI, ACLA· and ·IPNU, so I guessed some sort of jumble would be required there. The others looked as though they would end up being CANARY, TANAGER and possibly SULTAN. These were birds. From the title, I wondered if we were talking about endangered species, but as far as I know, the canary wasn’t on the list! Well, I had spotted the birds, and it didn’t take long to highlight the PMs, PEEL, CANNING and HEATH. That left the wild (ie anagrammed) flowers. The two down entries, ACLA· and ·IPNU, looked like they should be LILAC and TULIP, but that would require a misprint as well as a jumble. They were, of course, CALLA and LUPIN, with the third being PINK. Changing 16dn from CANNER (not TANNER as originally, thanks to Dave R below) to LANNER gave another bird, and ILLY (eventually found after 10 minutes of searching) was the wild LILY. Putting [Harold] WILSON under the grid completed an enjoyable puzzle. Thanks, Dysart. The Numpties were mildly concerned when we read the preamble and found that we were looking for clashes, unclued lights (some of them ‘thematically treated’) and another unchecked letter to change in an endgame that sounded unusually complex. In fact I have just read that last part three times to make sure that I have performed the necessary final steps. I did my customary scan and was reassured that Dysart was confirming his entry ticket for the Listener Setters’ tipsy club with ‘Old king supplied with drink promoting English duke’ (WINED with the ED ‘promoted’ to EDWIN). An intriguing common factor for the surface readings of Dysart’s clues is the presence of people in one form or another in so many of them: guerillas, church members, magistrate, footballer, sailors, the Bard, a cruel person – those seven came from the first seven clues! The same continued through most of the clues, almost flooring us on one occasion when we were looking for ‘Chinese mountain dwellers yielding half of fermented milk product’. My ODE didn’t have YAO (YAOORT yielding half) but fortunately the intersecting words gave us the word that was confirmed by Wikipedia. There were no other hitches and solving progressed steadily with it becoming clear very quickly that the clashes were along the secondary diagonal. I fed them into TEA while the other Numpty continued to fill our remaining empty cells. Oh the sneaky trick. I had to feed the diagonal in upwards to be given STANLEY BALDWIN and, of course, it was a gentle coast downhill to the conclusion after that. What did the ODQ give me? “There are three classes which need sanctuary more than others – birds, wild flowers, and Prime ministers.” Well, birds and flowers maybe – but Prime Ministers? (Or is it a question of sectioning one we have particularly objected to – I could offer a candidate or two!) The flowers are ‘wild’ so that explains why we found anagrams of them. TANAGER and CANARY were evident, but we had to search for SULTAN and we nearly came a cropper attempting to put LILAC in as an anagram to complete our trio of flowers (with PINK and LUPIN) until Mrs Bradford’s Crossword Lists nudged us into CALLA. 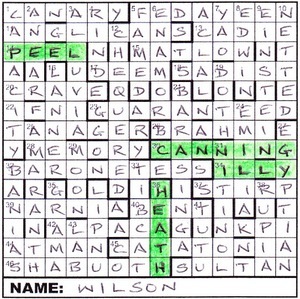 Three prime ministers were easy to find: HEATH, CANNING and PEEL and, of course, those extra letters N,O,I,L,S and W gave us WILSON. ILLY was obviously an anagrammed LILY and all that remained was to find an unchecked first letter that could be changed to give us our final bird. I hunted for a while, attempting to find a GRAHMI, a ZADIST a FRAMA or a BATATONIA – some new-fangled exotic flying thing, but luckily hit upon a bird I have never heard of, a LANNER, ‘a kind of falcon native to regions of Africa’, and happily, in just under three hours, was able to add the final touch, with thanks to Dysart for a most enjoyable solve. It was only when I was copying out an entry to send to Mr Green that I realised that the final grid consisted of almost entirely real words (with, of course, the anagrams that had been indicated). BANIAS seemed to be the only offender and perhaps that is a real word too?